Minority Leader Nancy Pelosi, D-California reaffirmed she is voting "no" on the budget deal reached between Senate Republicans and Democrats on Wednesday and the spending bill to fund the government, she said during an event to announce House Democrats' goals for an infrastructure plan. When asked by reporters whether she would whip her members to vote against it, though, she replied, "I'm just telling people why I'm voting the way I'm voting." That was a tacit acknowledgment that there will be many Democrats who vote in favor of the continuing resolution (CR) and budget caps deal to help get it passed. Wednesday, Pelosi broke the record for the longest House floor speech -- her eight-hour speech, the longest since 1909 at least -- was meant to protest the fact that the plight of DACA recipients has not yet been addressed by Congress. She said Thursday that the speech, during which she read the stories of Dreamers from across the country, demonstrated that "we have our beliefs and we are willing to fight for them" and that the "intensity" has increased on the speaker to hold an immigration vote. She reiterated that she is asking Speaker Paul Ryan to put any and all immigration proposals on the floor – including the conservative Goodlatte bill -- and then let whichever one gets the most votes pass out of the House (a "queen of the hill" strategy in the parlance she uses). Senate leaders unveiled the bipartisan agreement that would raise the spending caps on defense and domestic spending by $300 billion over the next two years. The increase would be divided almost equally -- $165 billion for military spending and $131 billion for domestic program spending. The agreement also includes $90 billion for disaster relief funds for areas hit by hurricanes and wildfires. The Senate is looking to vote on the budget agreement sometime Thursday. While the budget deal reached on Wednesday also includes language that would provide funds for infrastructure, Pelosi said the only reason Republicans added such funding was to get members of the House Freedom Caucus to vote for it. She called it a "diversionary tactic." The Caucus, however, released a statement Wednesday evening, opposing the agreement to raise spending caps. "The House Freedom Caucus opposes the deal to raise spending caps on discretionary spending by nearly $300 billion over two years. We support funding for our military, but growing the size of government by 13 percent adds to the swamp instead of draining it. This is not what the American people sent us here to do," the group said in a statement. 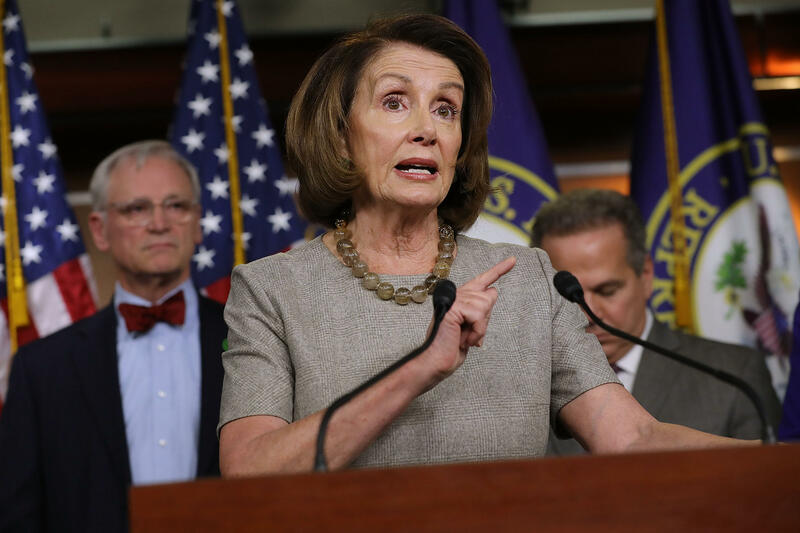 Meanwhile, House Democrats along with Pelosi pitched their own $1 trillion infrastructure plan dubbed, "A Better Deal to Rebuild America." Pelosi says the plan "fits comfortably" into Democrats' "bigger picture" of building up the nation's the infrastructure all over America "in a smart way." The announcement comes after President Trump teased his administration's plan to tackle the nation's deteriorating roads, bridges and railways during his State of the Union address late last month. Mr. Trump highlighted his plan to rebuild the nation's "crumbling" infrastructure in his remarks, unveiling his intentions to push Congress to approve a $1.5 trillion plan. The president's proposal involves just $200 billion in federal funds, with the balance coming from state and local governments as well as private investors. Some analysts say Congress is unlikely to pass the infrastructure bill this year, pushing off the much-needed investment until 2019 or later. Pelosi said Democrats were "receptive" to idea of public-private partnerships, as they relate to Mr. Trump's plan, but said the country needs a plan that "brings revenue back to the treasury, creates jobs and reduces the deficit. She added that the president's plan "shifts the burdens on to city and state budgets."